Chief Minister Pema Khandu on Wednesday took stock of the arrangements here at IG Park where the main function will be held. 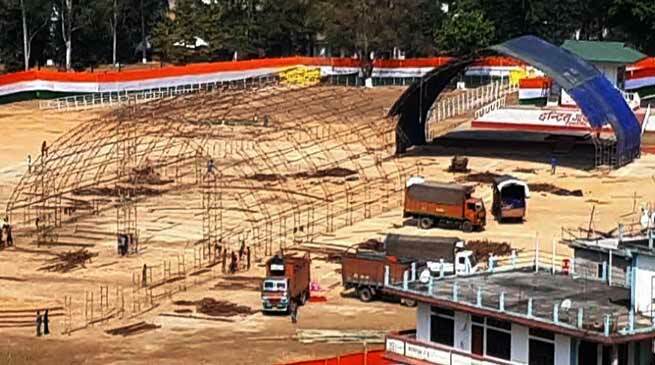 Ahead of the Prime Minister Narendra Modi’s visit in Arunachal Pradesh, Chief Minister Pema Khandu on Wednesday took stock of the arrangements here at IG Park where the main function will be held. PM Modi is slated to address the public meeting at IG Park, lay the foundation stone for the greenfield airport in Hollongi, and inaugurate the Film and Television Institute of India and the Doordarshan’s 24×7 satellite television channel for the northeastern states, Arun Prabha. The PM is also supposed to inaugurate the 110 mw Pare hydroelectric project. CM after visited the preparation at IG Park discussed with the team of officers there and necessary direction were issued in view of the completion of the work well ahead of the main function which is scheduled on Feb 9. IGP Sunil Garg when contacted said that elaborate security arrangement as per required is in view of the PM visit to Itanagar. Para military forces diploid in the capital for law and order duty in view of the PM visit, he informed. City SP said that we are doing all arrangement as per various guidelines of the visit for the Prime Minister, we would be issuing relevant advisory related to security and traffic. In a prohibitory order issued by Capital district administration have banned flying of all types of drones or other camera on aerial platform in Itanagar from Feb 6 onward. The road from Raj Bhawan helipad to IG park route vie 0 Point Tinali, Bank Tinali (NH-415) is being carpeted and welcome gates is being erected.